Pair of Maison Jansen attrib. 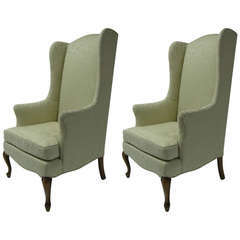 Louis XVI Style French wingback or armchairs in a Swedish Finish. These tall and sleek impressive arm or office chairs are simply stunning depicting the finest quality carvings on the Swedish off white paint decorated frame in its original antique finish. The Scalamandre fabric of yellow gold and multi-color stripes would accommodate all color schemes. This stunning pair to make a Fine addition to any room in the home or office. 1XhA. This piece is accompanied by a letter of Authentication from James Archer Abbott, Author of 'Designing Camelot: The Kennedy White House Restoration' as well as both Jansen Furniture Books. James Archer Abbott serves as Director and Curator of Johns Hopkins University’s Evergreen Museum & Library – one of two museums owned and operated by the university. Mr. Abbott's publications include the following exhibition catalogs: Visions of Washington Irving: Selections from the Collections of Historic Hudson Valley (co-author, 1991); Classical to 19th century America: The Influence of Berry Tracy on the Historical Interior (1994); and A Frenchman in Camelot: The Decoration of the Kennedy White House by Ste´phane Boudin (1995). Mr. Abbott co-wrote with Elaine Rice a further exploration of the Kennedy White House decor, entitled Designing Camelot: The Kennedy White House Restoration, which was published by Van Nostrand Reinhold in 1998. In 2006, he completed a well-received history of the international design firm Jansen (1880-1989), entitled "JANSEN," and published by Acanthus Press, LLC. This was followed by a companion volume, "Jansen Furniture," published in spring 2007. 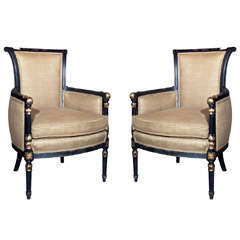 A pair of ebony paint decorated Maison Jansen armchairs. Each with a Louis XVI Style leg leading to a burlap newly upholstered chair. 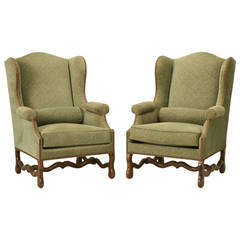 A pair of fine leather lounge or bergere chairs. Both having solid wooden framed in the ladder back style with cushioned leather seats and backrests. 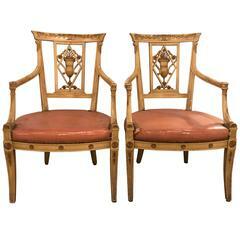 Gorgeous pair of antique Chippendale wingback arm chairs done in an elegant salmon and gold fabric.